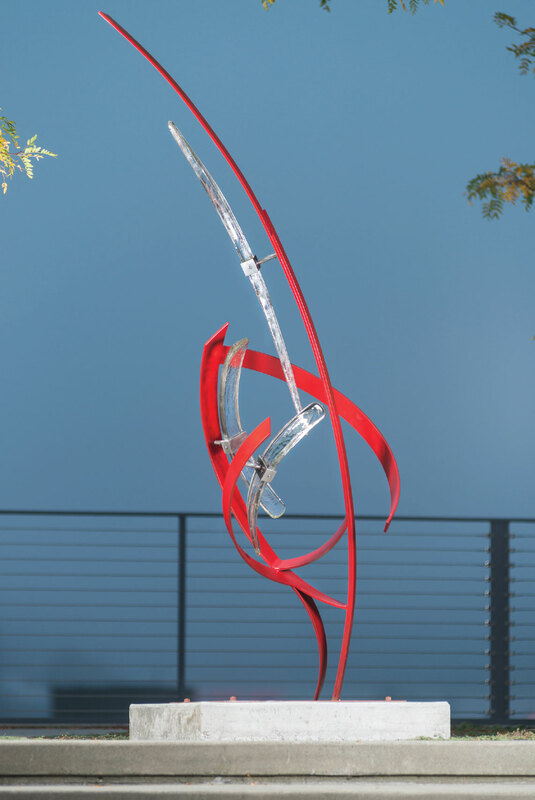 Ascent; 94”x 36”x 36” mild steel, glass. Ascent was commissioned by the city of Bellevue’s Bi-Annual Bellwether Exhibition in 2014 and on display at City Hall. In 2016-2017 it was on display at Palm Desert’s El Paseo exhibition. 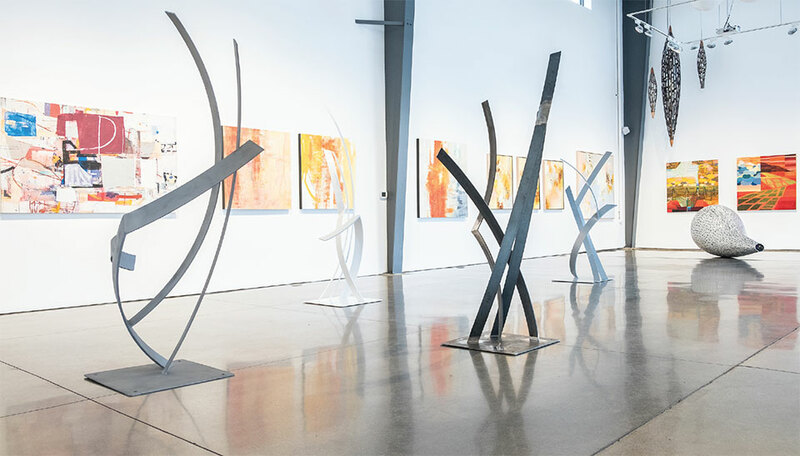 As an artist community on the rise, Bend has a prominent connection to the West and Northwest. With the vast Oregon landscape and the mighty Deschutes River, along with majestic views of the Three Sisters, it’s no wonder that artists are inspired to be in Bend. In this issue of Western Home Journal, we feature the work of a new artist, Miguel Edwards, who migrated from Seattle, Washington, even though his roots are in New Mexico, and who now makes his home in Bend. 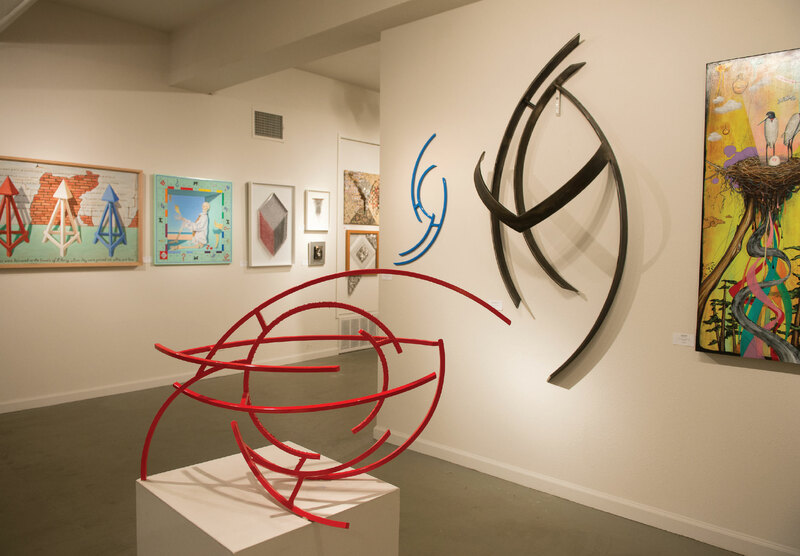 Edwards is a sculptor whose steel art is inspiring and imaginative. With a history and career as a photographer, Edwards’ work and process as a sculptor is something remarkable to behold. Along with Edwards, we also feature the work of George Gulli. 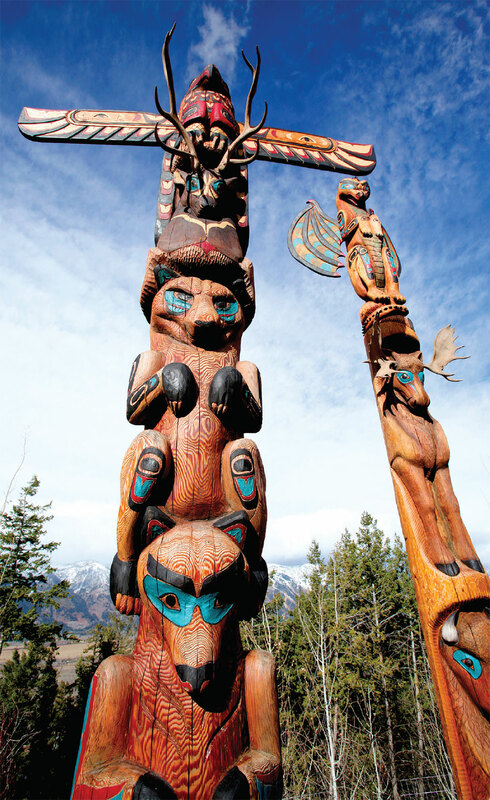 Gulli’s craftsmanship in his original totem pole carvings has a unique connection to collectors and art lovers who seek the rare, sublime, or ethereal level of art and heritage. 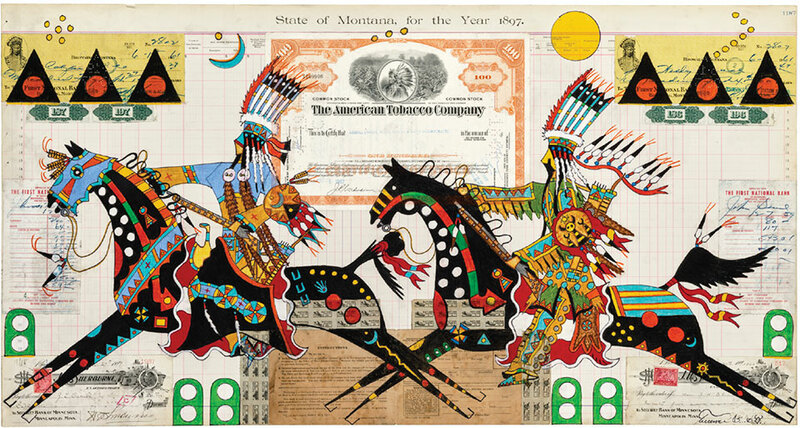 In addition, we also feature the ledger artist Terrance Guardipee. 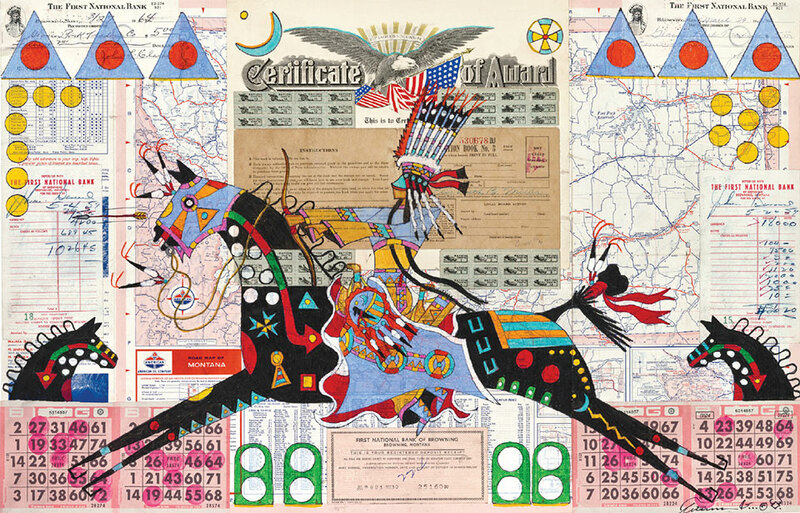 Guardipee offers his own historic lesson on Native American culture with a look to the future from his ancestral roots. Explore Western fine art throughout this issue of Western Home Journal as another element to discovering or enhancing your dream home and surroundings in Oregon. 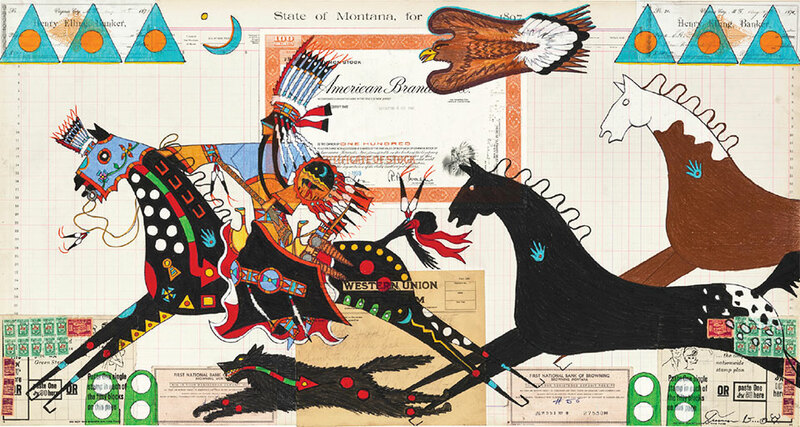 As you flip the pages of Western Home Journal, discover your own appreciation for Northwest, Western, and Native American art, influences, and antiquities. 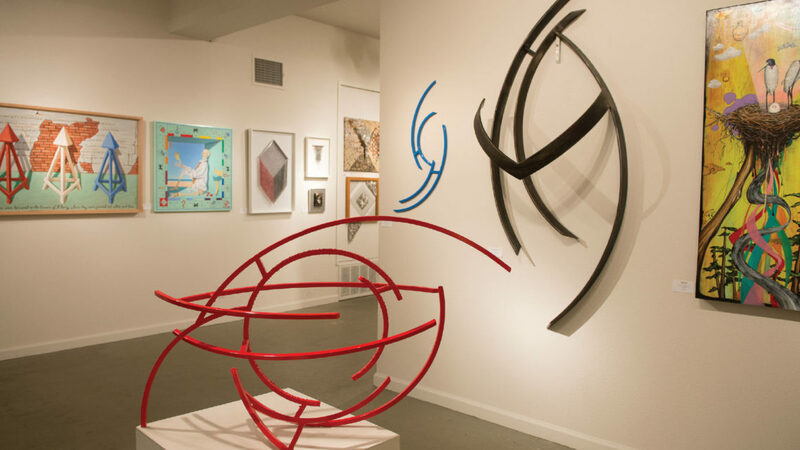 The Future is Liquid, a three-person exhibition at Space Gallery in Denver, with Michael Hedges and Monroe Hodder. 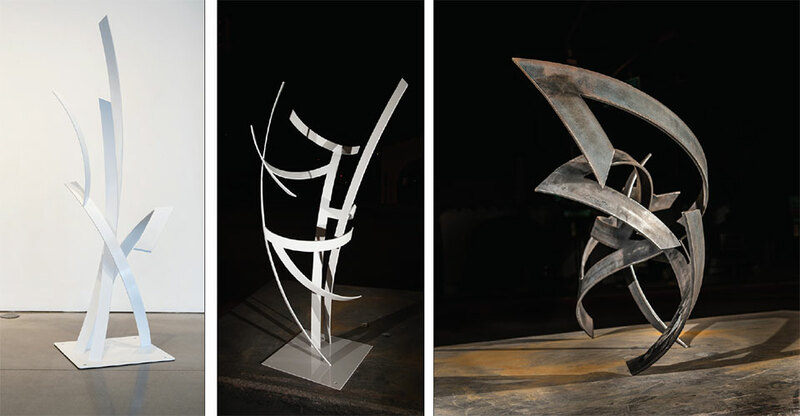 Left to Right, Wing Raven 78”x 36”x 41” mild steel, Magpie Moon 73”x 30”x 32” mild steel, Wing Raven 77”x 42”x 36” mild steel, Elephant Dreams 69”x 37”x 39” mild steel. Miguel Edwards is an artist who embodies the spirit of living in the West, from its desert environs to the mighty Washington and Oregon outdoors and Northwest coastal cities. Having recently settled in Bend, Oregon, Edwards is a native of New Mexico and identifies with his homeland more than anywhere else. Incidentally, Edwards’ home was close to where Georgia O’Keeffe resided, which may not come as a surprise as his use of shape, form, and line in his sculpture identifies closely with the stark beauty found in this part of the country. Edwards grew up surrounded by many generations of career artists on both sides of his family, which also influenced his art and life as an artist. When Edward’s work was published in Billboard Magazine and The Seattle Times, he decided to dive into photography. Edwards worked as a music photographer during Seattle’s music boom, and covered many a promising band. In 2000, Edwards embarked on his first sculpture commission with a friend and then another for Burning Man in 2004, but it was in 2009 when he declared himself a sculptor. Edwards and his wife decided to move to Bend so he could have a shop of his own where he could do his work, especially at the scale he needed. For Edwards, Denver and Southern California are prime markets for his contemporary metal and glass pieces, which he can access in a much more suitable way from Bend. Even though he has done so well as a sculptor, Edwards continues to love his work as a photographer. He says each medium informs the other. 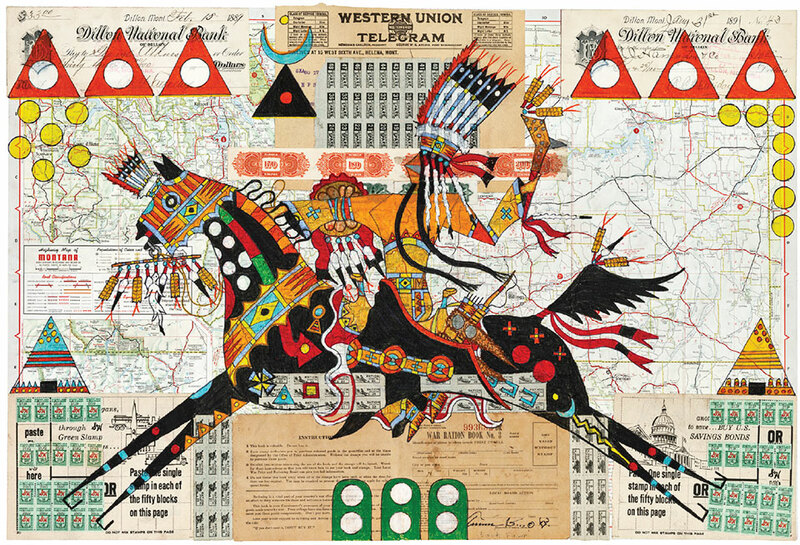 Edwards describes his art as a combination of influences from his high desert Southwest upbringing and his Northwest coastal urban living with an appreciation for the culture, land, and living in these parts of the country. In Bend, he’s adding and exploring new ideas that have been on his mind. As a member of Oregon’s Central Metal Artist Guild, photographing for Downtown Bend, working with the Bend Design Conference, and being honored as the featured artist for the 2019 Oregon Winterfest in Bend, Edwards is acclimating to his new surroundings with his art and craft well. 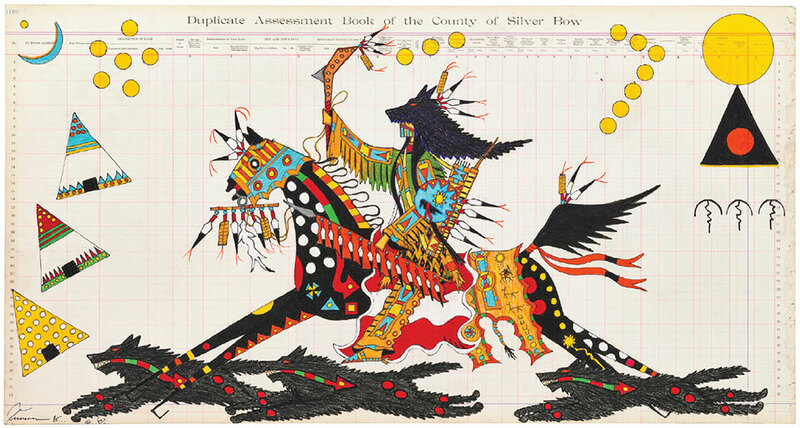 One of Edwards’ most acclaimed works, Hope Rising, was commissioned for the 50th Anniversary Opening Ceremony of the Special Olympics USA Games in Seattle, Washington. His work emanates a sense of power, but also represents empowerment. His smaller works are more fit for homes and private collections. Using curvy metal arcs, which appear light and wavy, especially when combined with his glass accents, give viewers a sense of weightlessness even though the pieces are very grounded and refined by the limited palette of the flat bar. In addition, the rolled flat bars create an effect, which appears like slices of a covered wall from a photo studio. They change the shape and color depending on how the light hits them. The radius exaggerates the penumbra, which is the transition of light to shadow. Miguel Edwards is an accomplished sculptor and recognized public artist as well as an editorial and architectural photographer. He has worked with many publications, museums, Fortune 500 companies, and municipalities. His new book, Seattle Art in Public Spaces, is currently available. Visit Miguel Edwards’ work and his creative diversity in action via @themigueledwards on Instagram or migueledwards.com.